Transformers is an animated television show that deals with robots in disguise; that is robots that are disguised as vehicles but will when the situation calls for it transform into their robotic counterpart to fight the other evil robots. The series shows that in the early years of planet earth, a ship from a robotic planet crashed landed on earth, with several robots inside. The robots wake up on present day earth. Here the robots attack each other to gain resources to get them back to their home planet of Cybertron. The Autobots, the Decepticons and the Hive all scramble to obtain the Cybertron plasma chamber key, with the fate of the universe in the balance. The Autobots on the planet Nebulos team up with rebels to defeat the evil Hive, who have enlisted help from the Decepticons. Escaping with the key to the Cybertron plasma chamber, the Autobots crash on Nebulos, a planet ruled by the Hive, a group of tyrannical telepaths. As a plague spreads among robots and humans on Earth, a fallen leader must rise and reclaim the Matrix of Leadership from an infected Rodimus Prime. Eager to destroy the Transformers, scientists infect them with a plague that will pit Autobots and Decepticons against their own kind. When the Autobots free the planet Zamojin from its space-warp prison, the power which the Quintessons fear most is able to escape. When the Decepticons steal the Autobots' Matrix of Leadership, the Autobots must face the more powerful Scourge without a leader. The Dinobots, Predacons and Terrorcons desert their fellow Transformers in the middle of fighting a supremely dangerous, energy-draining enemy. The Technobots encounter a conniving smuggler who claims the Quintessons stole a dangerous machine from him. Is he leading the Technobots into a trap? When an accident causes the Dinobot Grimlock to become a genius, he also becomes the Autobots' only hope for stopping the Decepticons' latest scheme. A crime lord entraps the minds of Autobot leaders in synthetic human bodies so he can use their robot forms to destroy the other Autobots. When the Junkions refuse to hand over an ancient journal, the Quintessons resort to subliminal tricks that cause galactic chaos. The Autobots need a Quintesson journal to establish peace between two alien races, but the Quintessons don't want to give up the secretive document. The Desepticons have stolen Metroplex' transforming cog and First Aid is blaming himself for it. He believes that he doesn't fit in with the other Autobots and leaves. The Quintessons kidnap Daniel and use a special machine to turn Daniel's nightmares into reality. When the vampiric Dweller gets loose from the dark core of Cybertron, it threatens to turn all the Transformers into zombie-like creatures. Starscream's ghost is back and this time he possesses Scourge. He goes to Unicron (or what's left of him) and ask him for a new body. Unicron promises Starscream a new body, but only if he do something for Unicron. The Desepticons can't stand Galvatron's insanity any more, so they lure him on planet where they treat mental patients. But the treatment doesn't going as planned. The Desepticons have taken over a planet inhabited by a group of pacific Autobots who doesn't believe in war, and they're being used as slaves. But their leader Sandstorm managed to escape and asks the Autobots on Cybertron to help them and convince his people to defend themselves. In a world where the inhabitants speak in music, the Decepticons hope to find three whose combined harmonics are powerful enough to destroy a planet. Daniel and Wheelie want to prepare a surprise birthday party for Ultra Magnus. But they don't know when he was created, and neither anyone else for that matter, so they're off to Autobots storage asteroid which keeps all vital Autobot information. But they're being followed by the Desepticons. While trying to stop the Quintesson scientist from opening the time portal, Perceptor, Blaster, Blurr and Wreck-Gar travel to Cybertron's past where they have to help the rebellion to overthrow the Quintessons. To makes things worse, the rebels' leader A3 was transported into present. Octane and Trypticon make a deal with Abdul Fakhaddi, the ruler of Carbomya. They will steal all the world's monuments for Fakhaddi in return for his oil which apparently makes much better and more powerful energon then usual. Starscream's ghost, who possessed Cyclonus' body makes a deal with an exiled Desepticon Octane to overthrow Galvatron. While Rodimus and the other Autobots were attacked by the Desepticons, they were rescued by none other then Optimus Prime who is apparently alive and ready to reclaim his leadership over the Autobots. But is everything alright with him? The Autobots are investigating the case of destroyed Earth's Defence Command's shuttle. The trail leads them to a planet Dread terrorized by a giant monster Chaos who have unsettled score with Kup from long time ago. A Quintesson scientist kidnaps Ultra Magnus, Cyclonus, Wreck-Gar and Marissa in order to study them. But soon, the captives started the rebellion and the ship lost control as it's heading for a black hole. Blitzwing accidentally overhear the Quintessons' plan to get rid of the Decepticons after they destroy the Autobots. He reports what he heard to Galvatron, but he doesn't listen to him, so he ask Autobots for help. While the Autobots at the Autobot City on Earth wait for Blurr and Wheelie to get the transformation cog of Metroplex - the only Autobot who can stop Trypticon, who is terrorizing Earth. The Desepticons attack the Autobots on Goo, but soon Galvatron arrives to reclaim his leadership over the Desepticons and to destroy the Quintessons. But they make a deal with Galvatron promising to him the certain Desepticon Matrix. Soon, the Autobots are rescued by Wreck-Gar, and Rodimus goes deep into the Matrix once more where he learns that the entire race of the Transformers is made by the Quintessons themselves who now want revenge. The Decepticons attack both Cybertron and Earth, but without Blurr, Wheelie and Metroplex' transformation cog, the odds aren't looking good for the Autobots. Determined to destroy the Autobots, the Quintessons destroy their home planet Quintessa hoping that the explosion will destroy them too. The Autobots survive but without a ship, as they find themselves on the sticky planet called Goo. Blurr and Wheelie who were supposed to deliver the transformation cog of Metroplex to the Autobot City on Earth are trapped on one of Jupiter's moons. Meanwhile the Quintessons make a deal with the Desepticons that they will give them enormous amounts of energon if they destroy the Autobots. After Rodimus and Grimlock saw weakened Desepticons, they realize that they couldn't abduct their friends, but soon they were discovered and attacked by the Desepticons. Springer and Arcee save them right on time and Rodimus falls into deep trans as he goes deep into the Matrix and learns that the Quintessons are the kidnappers. Meanwhile, Cyclonus and the Sweeps have found Galvatron at the lava lake on the planet Thrull, but it seems that something is wrong with their leader. While the Autobots are celebrating the end of the war (as seen in the movie), the Desepticons are starving from energon. Cyclonus and the Sweeps realize that the only one who can save the Desepticons and lead them to victory is Galvatron and they're off to find him. Meanwhile, Kup, Ultra Magnus and Spike are kidnapped and the other Autobots think that the Desepticons are responsible. While Arcee and Springer are off to rescue them, Rodimus Prime and Grimlock are spying on the Desepticons. 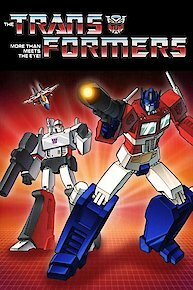 Transformers is currently available to watch free on Cartoon Network and stream on Syndicated. You can also stream, download, buy, rent Transformers on demand at Amazon, Vudu, Google Play online.